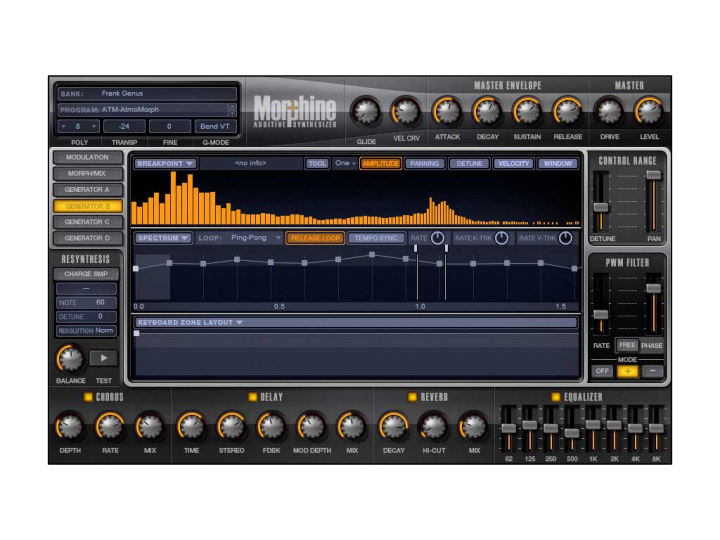 Info über "Image Line MorphinePlug-In FL/VST/AU ESD - Synthesizer"
• High quality sound engine optimized for low CPU usage and fast amplitude and frequency modulation response. • Keyboard layering with 128 unique Keyboard Zones. • Unlimited number of harmonic “snapshots” (breakpoints) per spectrum. 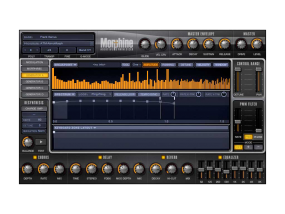 • Amplitude, Detune, Panning control for all harmonics. • Filtering and Velocity response for each Generator source. 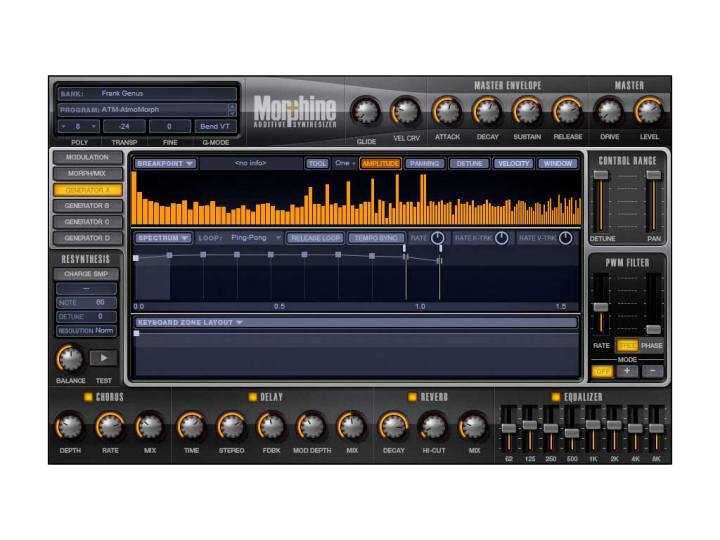 • Highly CPU optimized, accurate Resynthesis allowing emulation of audio samples with high precision. • Manual override options for the resynthesis process to achieve most accurate emulations. • Ability to import waveshapes from audio file. • Variable-time control for spectra, mix/morph envelopes (can also be linked to key number, velocity or any other controller). • Additional generator that allows any Noise Sample audio file to be mixed with the synthesized sound, complete with filtering. 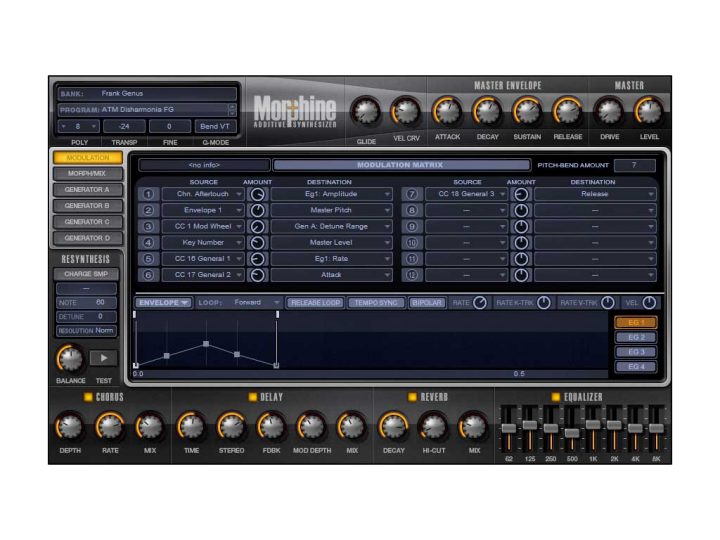 • Morphing path, morphs harmonics in real-time, controlled internally or from external modulation source/s. • Morphing Square, mixes the 4 Generator sources with a single convenient interface. • 1 to 32 note polyphony, user selectable. • Velocity response is adjustable. • Up to 5 built-in simultaneous effects: Chorus, Delay, Reverb, Equalizer, Distortion. • Attractive, user friendly interface, developed through 1000’s of man-hours testing and development. • 340 high quality factory sounds. • 100Mb free disc space. 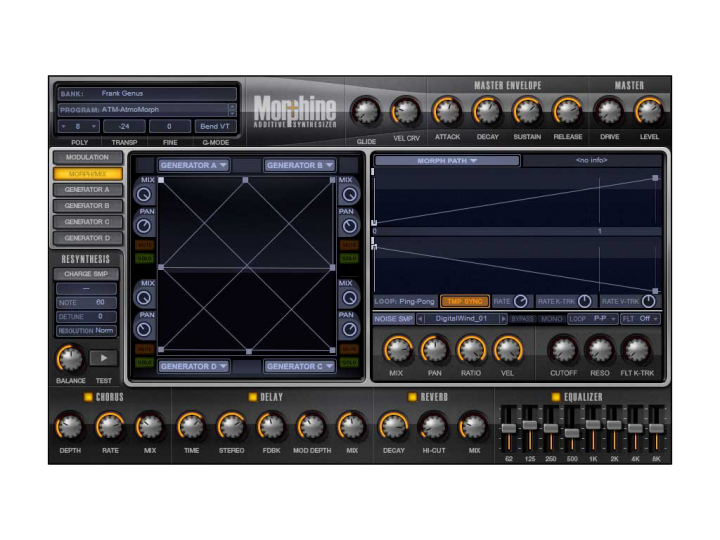 Weiterführende Links zu "Image Line MorphinePlug-In FL/VST/AU ESD - Synthesizer"